It was time to get serious. After three kids, not enough time, not enough sleep and my metabolism slowing more dramatically with every birthday, enough was enough. I used to be fit, healthy and able to wear a lovely variety of clothes. Now I was sluggish, carrying too much weight, and struggling to feel good in my own skin. After joining the gym two years ago, I was on a cardio-fuelled treadmill to nowhere. You know the feeling – week after week you knock yourself out in the cardio classes, and yet you just don’t see the results. So I went to see Nicki. I was interested in what Nicki had to offer because of her specialisation in womens’ health and postnatal training. I also wanted to know a bit more about Biosignature. Heck, why not give it a try? I felt like I’d tried everything else. Am I ever glad that I did! After my first visit with Nicki, everything that I ever thought that I knew about weight loss was turned upside down. Nicki took body fat measurements and with those results was able to determine what hormonal, dietary and other imbalances were affecting me. For example, I was painfully aware of my “back fat” but I had just assumed that losing that fat was simply a matter of the right toning exercises. Not so. It was an indication of my diet being high in sugar because I was insulin resistant. The truth that I had sometimes suspected but had not really wanted to confront was that I did have an issue with sugar. I felt that I was far too young to succumb to diabetes, particularly when I’d created the problem myself. Nicki set me on a path that eliminated sugar from my diet – the back fat all but vanished, the nasty sugar addiction is gone and my eating habits are under control. I now have the energy I so desperately need as a busy mum of three young children and I’m enjoying a much more active lifestyle with my kids. 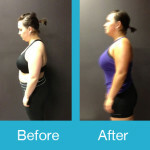 I worked closely with Nicki for 8 weeks and achieved a 10 kilogram weight loss in that time. Her training sessions also ensured that I had a brand new muscle tone that I’d never, ever known. 9 months later, I’m still seeing fantastic results. Not only was Biosignature useful for body fat measurements, but the supplements have also given me a boost. Nicki has been able to identify and rectify mineral deficiencies as well as targeting specific problem areas with detoxification. The results have been fantastic and have contributed to my overall wellbeing. It’s been an amazing journey. A year ago, I never believed I would ever be able to get myself out of the sugar trap and I certainly thought my best days were behind me. Now I think my best days are yet to come!